Issue of Credit notes is an age old practice in business environment. They are issued by supplier to buyer for the sales return transactions. In GST there will be a tax component in each & every taxable supply transaction. When there is a supply of goods or services, supplier is liable to pay GST on such transactions. However, in credit note transactions, complexity is involved in adjustment of Output Tax liability for supplier & reversal of Input Tax Credit claimed by the recipient on such returned goods. 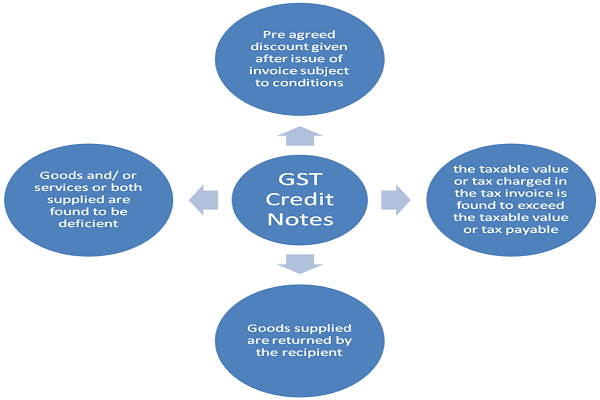 In this article let us briefly identify the challenges involved in Credit notes transactions in light of GST Annual Returns & Department Circular 72/46/2018-GST dated 26.10.2018. When GST Credit notes can be issued & who can issue GST credit notes???? From the above it is clear that GST credit notes can be issued only by supplier of goods and services in the situations stipulated above. In GST while dealing with Credit note transactions both output liability and outward taxable supply turnover of supplier stand reduced in supplier’s GST returns. Similarly, the recipient returning the goods is liable to reverse input tax credit availed on returned goods or services in his GSTR 3B. In this regard, the attention to proviso to Section 34(2) is required, where reduction in output liability of supplier is not permitted, if the incidence of tax and interest on such supply has been passed on to any other person. Therefore, the supplier is not permitted to issue GST Credit notes when recipient availed Input tax credit on returned goods. Due to non operation of GSTR 2 and GSTR 3, it is a challenge for supplier to verify whether input tax credit was availed by the receiver on returned goods or not. When there were multiple invoices with different dealers it would be much more difficult for suppliers to monitor input tax credit status for each and every dealer on returned goods. For these reasons, the supplier may issue credit note reducing the value of original supply without disturbing the tax component on original supply. 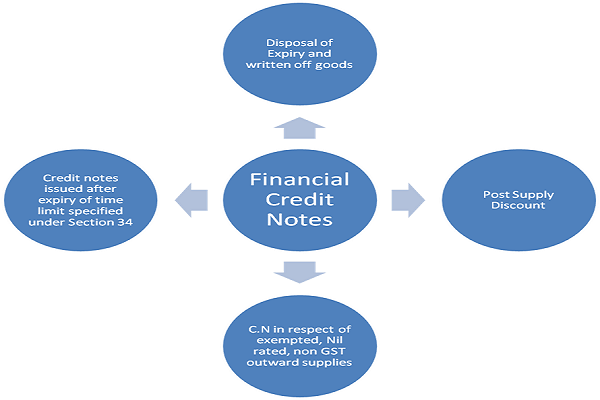 Such credit notes are referred as ‘Financial Credit notes’. In financial credit notes, the recipient is entitled for full input tax credit on original supply without reversing any Input tax Credit on returned goods. In supplier books of accounts they would have been duly recorded by adjusting in taxable sales without declaring the same in his GST Returns, as it does not affect output tax payable. Many recipients instead of issuing delivery challan on returned goods they were recognising purchase returns as sale transactions and issuing tax invoices on the same without reversing any input tax credit on returned goods. This procedure was not recognised under Section 34 of CGST Act. To clarify this issue, the department vide Department Circular 72/46/2018-GST dated 26.10.2018 has clarified that for returned goods the dealer can follow either of the two procedures mentioned below. This clarification ensures to bring uniformity with respect to procedural compliance of returned goods. However, there are certain dealers following hybrid procedure where recipient is issuing tax invoice on returned goods and original supplier is issuing GST Credit notes on the same. There may be various reasons for the same like non recipient of account copy from the supplier in timely manner or non reconciliation of GST Returns with GSTR 2A. In the GST Returns of recipient when hybrid model is followed, the Table 8D will be negative, as Table 8A auto populates net of Input Tax Credit with Credit notes from GSTR 2A. In this situation, the original supplier might have issued credit notes but the recipient might not have recognised the same by not reversing of Input Tax Credit in GSTR 3B. This may result in negative balance in Table 8D of GSTR 9 inviting unnecessary litigation from the department as the same depicts as excess claim of input tax credit in GSTR 3B over GSTR 2A. So adequate care should be taken by the dealers while dealing with Credit notes in GST Returns by complying with Section 34 read with procedures laid in department Circular 72/46/2018-GST dated 26.10.2018. Hi, in case of goods return, can a dealer return material with only delivery challan? He would not need e-way bill? Won’t they have to have other documents to produce for transportation or GST fellow during the journey? We are issuing Debit Note to supplier for goods returned with reversal of input tax and adding to outward liability in 3B and shown in GSTR 1. Is it right of doing ? For reversing ITC the credit notes issued by supplier shall be triggering point. Similarly, when debit notes/ sale invoice is issued then no need for reversal of ITC. In your case the same has not been followed you have adopted hybrid model which may result in unnecessary mismatch of GSTR 2A. Please refer to department circular 72/46/2018 mentioned in my article. you have adopted hybrid model which is incorrect. Refer to department circular 72/46/2018 in my article.